Inducted 1994. Averaged 25 Points as a Senior, Named Parade All-American. Class of 1967. Despite being just 5-foot-9, Bernbrock was unquestionably one of the best basketball players ever to wear the blue and gold. As a junior, Bernbrock averaged 18.1 points for Christian Brothers, which finished 18-6. 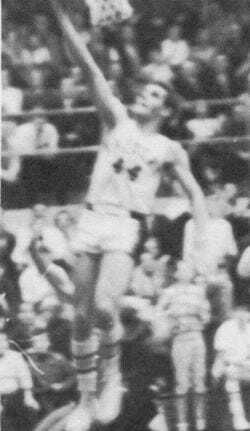 During his senior season of 1966-67, Bernbrock averaged 25.4 points and 7.2 assists per game and added 72 steals in leading the Raiders to a 20-5 record. He had seven games of 30 points or more and had a career-high of 41. He was also noted as an outstanding defensive player. He made 51 percent of his field goal attempts and 82 percent of his free throws. His 634 points are believed to be a single-season record, and he left CB with 1,525 career points – second-best in school history. He was named to the fifth team on Parade Magazine’s All-American team. Only 25 players were honored by the magazine. Bernbrock was also named to the Champaign News-Gazette all-state team. He was believed to be the first Raider to earn four varsity letters in basketball, and he was also a member of the baseball and golf teams. Bernbrock accepted a scholarship from Louisiana State University, where his brother Greg was an assistant, and played for two years alongside “Pistol” Pete Maravich, a member of the National Basketball Hall of Fame. He transferred back to his hometown and played for a year and a half at Quincy College. Bernbrock is single and lives in Quincy. He remains involved with basketball by coaching the Quincy Aces, a seventh-grade team made up of players from parochial schools, and also coaches at the YMCA and CYO.